I love waking up on Mondays to find out what PaperTrey Ink has in store for us on Make It Monday. Today the challenge was to use an embossing plate, chalk over the impression and then stamp on it. I can't deny that it took a few tries, but I finally got a result I like. I do love how the texture shows up so nicely when covered with the chalk. So maybe I'll do this again! Anyway, there is a whole week for you to play along too. So click right here for the link. Susie your chalk on the tag turned out beautifully! I LOVE the red and white polka dots, nice way to make it your own. Great idea to use a tag...and the background paper really makes it pop! Very cute! Very very cute! Love the polka dots! Super sweet card! 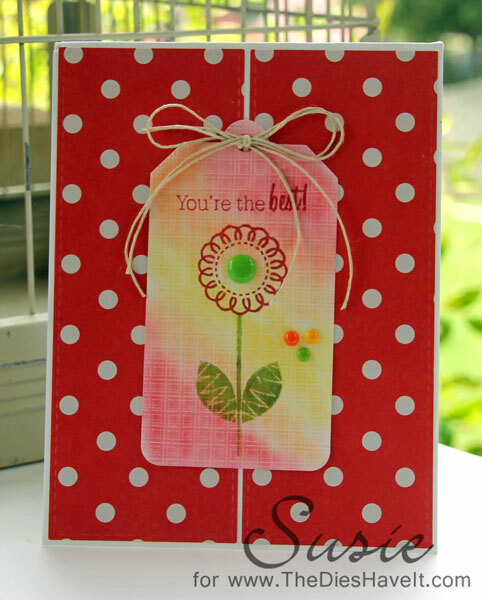 Love how the tag came out and the polka dot background really makes the tag pop! Sweet tag and flower. I had to go look at my collection of Flower Fusion to find that flower image you used. I'd forgotten how cute those flowers can be. Love the red - did you make that background paper? You must tell us how you got it so perfect! The red with polkas is really eye catching! This is fantastic, Susie! Love the texture you chose. This pattern was the first PTI impressions plate I bought. Great design with the tag!